It is hard to grasp the epochal significance of ratings agency Standard &amp; Poor’s downgrade of the United States’ credit rating, nothing less than an ideological humiliation of the world’s largest national economy. This after a week dominated by massive falls on stock markets across the globe and the “resolution” of the political crisis over the US debt ceiling, and all during a prolonged and deep global recession, only surpassed in historical terms by the Great Depression. Capitalism as a social system has never looked so sick, so unable to meet human needs, and so incapable of solving its own problems (even on its own terms) in our lifetimes. This week’s panic recalls the situation in the US in late 2008, when George W Bush infamously proclaimed, “If money isn’t loosened up, this sucker could go down.” Trouble is, money is loose today — very loose — and we teeter on the edge of the same precipice. The prolonged falls on share markets this week have been more sustained than those seen during the Great Crash of 1929. That US Treasury officials are trying to get the S&P downgrade reversed on the basis that it was delivered due to a “math mistake” indicates the desperation over this symbol of US power. It is important to understand that the US maintained a AAA rating despite the last 40 years seeing its relative economic decline, despite the contraction of its manufacturing base, despite its descent into being the world’s biggest debtor nation, and despite its massive public sector debt (that has been chronically much worse than most of the countries now being hammered over their “sovereign risk”). 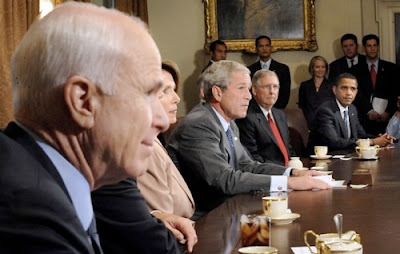 Yet it was the Obama-Republican debt agreement that precipitated the downgrade: The commitment by both sides to dismantling the last remnants of the New Deal and thereby serving up on a platter the Democrats’ electoral base and the working class to the banks, finance companies and assorted plutocrats who really run America. The downgrade comes precisely because of the insane refusal to even hint at tax increases to stabilise the deficit. Instead, in a country long tied to state intervention to keep the economy going, the state will slash spending on an unprecedented scale. Any last hopes for economic recovery are being sacrificed at the altar of ensuring the ruling class gets to hold onto every last penny of the surplus it has extracted from the toil of American workers. It is truly a case of “take the money and run” — and damn the consequences. It reveals a central fact of capitalism that Marx was very clear on: In a crisis individual capitalists will protect their own wealth even when that means risking the collapse of the system as a whole: Après moi le déluge! (“After me, the flood!”) Now, undoubtedly there are ideologues within the US establishment who believe that a cracking recession is what is needed to smash the working class into submission and thereby increase profit rates, but given the scale of global economic woes it would be an infinitely safer bet to play Russian Roulette. This is the quality of capitalist “leadership” today: You have to wonder how they can sustain the claim that workers couldn’t possibly do a better job of running society than this lot. As US writer Mike Davis has pointed out, not only is the US in deep trouble and the Eurozone in a rolling crisis, that third great pillar of modern capitalism, China, is showing signs of disappointing the latest round of fantasies that someone has finally “discovered the law of perpetual motion, creating a market economy immune to business cycles or speculative manias.” Chinese manufacturing growth has stalled in the context of several years in which there has been a construction bubble, runaway real estate speculation and the growth of a shadow banking system. Of course the cries are already coming that while we are “not immune”, “Australians should never forget that our economic credentials are among the strongest in the developed world and that Australia has a proven track record of dealing with global economic uncertainty.” These words come from Wayne Swan, who drove a massive program of state spending in 2008-9 to save Australian capitalism from the fate that befell most of its trading partners. Today Swan is better known for having disavowed that “track record” in order to spruik the virtues of slashing government deficits in an age of austerity. More worrying is that the other thing that saved Australia post-GFC was its niche role as a commodity exporter, yet now serious analysts are predicting “the end of the commodities boom,” indicating that avenue may be drying up faster than mining sector hype would have us believe. There is little doubt that the elite response to the rolling crisis will be more of the same, the direct or indirect shifting of costs downward onto the mass of the population. Already Australian workers have seen a year of growth in their superannuation wiped out in a week of share market collapse. Peter Hartcher, fresh from his recent whitewashing of the Islamophobic Right, talks of Australia’s buffer being its very low public debt — because it can then soak up private capital’s losses and transfer them onto ordinary taxpayers! And the way to ensure the country is up to paying for more bailouts for the capitalist class? The Gillard government needs to press ahead with a serious reform agenda and look to new ways of consolidating the federal budget. And the Abbott opposition needs to stop scaring the pants off the public. Left Flank has no interest in Abbott’s right-wing populist scaremongering. But the crisis of capitalism and the political elite’s desire to make us pay for it should make us all afraid, very afraid, of what’s around the corner. In every country the process is different, although the content is the same. And the content is the crisis of the ruling class’s hegemony, which occurs either because the ruling class has failed in some major political undertaking, for which it has requested, or forcibly extracted, the consent of broad masses … or because huge masses … have passed suddenly from a state of political passivity to a certain activity, and put forward demands which taken together, albeit not organically formulated, add up to a revolution. A “crisis of authority” is spoken of: this is precisely the crisis of hegemony, or general crisis of the state. While the ruling class is in disarray, and traditional loyalties are questioned, political spaces open up for new alternatives. However, as we have seen in the cruelest terms in Norway this is not always a space filled by progressive voices and Left movements. Islamophobia, and fascism of the sort Breivik was attracted to, are alternatives people can turn to when all seems lost. True political action always lacks guarantees — a point obscured by the myth of progress. To act politically is to act without knowing the results in advance, precisely because real political action … can transform the very terrain on which its consequences are evaluated. In this sense, to act politically is truly to “demand the impossible”, as every political act contains the potential to make what seemed impossible possible. What seemed out of reach only months ago — whether it was democracy in Egypt or mass revolt against the Spanish government — now seems to be the start of something else.